An outstanding combination of ingredients, aromatic spices, and herbs, fine wines, and cheeses… It is for sure that unique gourmet cuisine is one of the calling cards of France along with the iconic Eiffel Tower, gorgeous Versailles and sun-kissed French Riviera. It goes without saying that French dishes have long been considered a real culinary classic and loved by gourmets from all over the world. In this piece, we’d like to introduce you to the most famous must-tries during your upcoming French trip. French dishes are all about small yet saturated portions, miscellaneous sauces, selectivity in the choice of ingredients and elegant serving, which makes French food one of the best in the world. Naturally, the traditions of cooking vary from one region from another as each of them boasts some original recipes, passing from generation to generation. Thus, the north-westerners generously use butter and cream while southerners abundantly dress the dishes with olive oil and herbs. Eastern French in their turn have adopted some features of German cuisine, including sausages and sauerkraut. One of the most famous French favorites is onion soup which you can try almost in every restaurant in all parts of France. Actually, there is no particular preference for a certain kind of meat as local cuisine is full of exquisite mixtures and surprises. Those preferring something traditional and familiar should try the famous beef steak "entrecôte", beef in the onion sauce "miroton" and "escalope". But if you desire to try something way more refined and even aristocratic, French chefs will definitely please you with such legendary local specialties as "frog legs" and "foie gras". The French region of Bretagne is a true seafood lovers paradise. Therefore, you cannot leave without trying local oysters sprinkled with lemon juice, langoustines, lobster soup, and stuffed crab. While in Burgundy, you can’t miss tasting amazing grape snails "escargot de Bourgogne", traditionally prepared with creamy butter, parsley, and garlic and served in their own shells. The most consumed dairy product in France is cheese. It's quite impressive that the country boasts around 400 cheese types so even the most demanding gourmets will find the one to their taste. Creamy Camembert, semi-soft Maroilles, blue sheep Roquefort, orange Mimolette...it's only the beginning of the whole diversity that France has in store. Traveling around southern France is a nice chance to enjoy the specialties of Provencal cuisine like the fish soup "bouillabaisse", the authentic salad "nicoise", originated in the city of Nice and the famous vegetable stew "ratatouille", the one the chef-mouse from the cartoon cooked. There is no doubt that the French are one of the trendsetters in the world gastronomy so the variety of French desserts is truly impressive as well. In fact, lots of delicacies, without which sweet teeth from all over the world can’t imagine their lives, were invented by French pastry chefs. Of course, it’s impossible to enumerate all sweet masterpieces at once so we’ll mention the most popular ones. 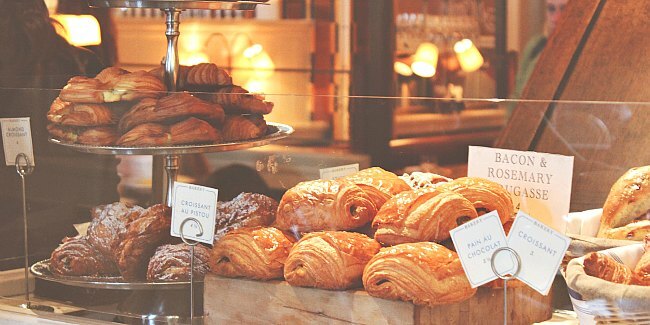 The true calling card of the best bakeries in France is warm aromatic croissants. So it is the real French classic - to have a cup of coffee with this buttery flaky pastry for breakfast in one of the cozy cafes in Paris. The second place fairly goes to éclair, an oblong pastry filled with cream and topped with tasty chocolate icing, invented by the confectioner Marie Antoine Carême who worked as a court chef for George IV and the Emperor Alexander I. One more popular dessert is a macaron, consisting of only a few ingredients: whipped egg whites, icing sugar, almonds, and food coloring. This was the favorite dessert of the French monarchs and the aristocracy. Marie Antoinette even named her cat after this outstanding delicacy. Apart from these three, take the pleasure to taste original French meringue, souffle, fruit pie "clafoutis" and cream puff "profiterole". It is no surprise that wine-drinking is an intrinsic part of local culture. Interesting to mention that the popular professional words regarding wine like "sommelier", "assemblage" and "appellation" have French roots. So what are the wines that definitely worth giving a try? The most praised wine region in France and the world is Bordeaux which produces around 720 million bottles per year. 85% of the total wine production in Bordeaux is dry red wines. The leading wine brands of the region include "Château Lafite-Rothschild", "Château Latour", "Château Margaux" and "Château Haut-Brion" that belong to the highest Grand Cru category. Being the oldest wine region, Burgundy has been popular since the times of the Roman Empire. If you want to taste some quality white wine you can choose among such producers as "Jean-Marie Raveneau", "Comtes Lafon", "Guy Roulot", "Pierre Morey" and "Olivier Leflaive". Quality red Burgundy wines include "Chambertin-Clos de Bèze", "Chapelle-Chambertin", "Ruchottes-Chambertin" and "Clos des Lambrays". You also won’t be disappointed by trying white wines of Alsace, rose wines of Provence, "syrah" wines from the region Vallée du Rhone and red wines from the region Languedoc-Roussillon. The region of Champagne, apart from producing fine wines, is the motherland of the sparkling wine of the same name. To diverse your experience, you should try local cider or a stronger apple brandy "Calvados" from Normandy that is famous for its apple orchards. Two more strong beverages originated in France are the sorts of brandy "Cognac" and "Armagnac". France, indeed, boasts a great number of various restaurants, waiting for you on every step: from famed gourmet Michelin starred restaurants to smaller family-run cafes, serving traditional specialties. For instance, traveling around Paris you can't miss the opportunity to pop in the posh Le Cinq, the legendary Le Procope, and the elegant Le Meurice, while seekers of something less fancy but delicious and classy can enjoy an evening at Le Cappiello or Le Baudelaire. However, not only Paris is rich in amazing places to dine in so the list of best restaurants in France can be also enhanced by MaSa in Ile-de-France, JAN in Nice, La Vague d'Or in Saint-Tropez and La Cour de Louvre in Avignon. To sum up, France is a great destination, no matter what travel goals you have set: immense sightseeing, history exploration or gastronomy experiences. Learn more about France tour packages on our website and choose the one to your taste to discover fascinating France at its best.